Capcom has been marketing the release of Resident Evil 7: Biohazard (or Biohazard 7: Resident Evil as it is in Japan oddly enough) in a fairly interesting and possibly most unique way as far as the 20 year history the franchise is concerned. However in the middle of all this work they’ve been hiding somethings directly in front of us. Wanting the fan base to question what it means. Between the original “Kitchen” VR demo at E3 2015 seemingly unrelated; the short time between announcement and release date; and the updated, and still to be updated again, Beginning Hour demo - Capcom is certainly drawing out a lot of speculation on both the game and the future of the franchise. Mostly by providing more questions than answers. One thing people did note, myself included, is when the Beginning Hour demo launched a few months back. Something actually in the very start of the demo. Appearing with the slate which appears before the in-game VHS tape plays, which is the image right at the top of this article. Specifically they talk about this part. This seemingly random selection of letters and numbers isn’t actually random it all. It’s actually mostly an old PlayStation SKU code for a two disc game set. The set in question is specifically the 1997 release of Resident Evil: Director’s Cut, which is US-00551, and the Resident Evil 2 Trial Edition demo disc that came with it, coded as disc 90009. That image of crazy eye Chris still makes me scratch my head all these years on. Image thanks to the REWiki. Now this has lead to all sorts of speculation, it’s clearly intentionaly done but it doesn’t have any answers. I certainly would have left it just there as some weird tease, and that would be it. Except this week at the Tokyo Games Show they showed the public at the event the complete “other” demo, and with that demo was a new VHS slate. This demo was at Gamescom and currently has been on the show floor at the TGS as well - it is the so called “Lantern” demo, which in game is code named Mia at the start. It is however this screen we want to check again because they have shown the new slate publicly for the first time. She hasn’t even started and she looks fairly freaked out. This was showcased as part of the live events Capcom did publicly at the TGS, which is why there is a woman wearing white on the right playing the demo. The video can be found here thanks to the vigilant and wonderful crew at BiohazardFrance.net. Indeed seeing as I’ve lead with the SKU code from the public demo, your eyes are likely drawn to the code on the left here again. And you’ll note it that indeed it doesn’t match the previous one, so you’d assume that it is another game. If so, you would be correct in this assumption. In this case it is the SKU for the US release of Resident Evil 3: Nemesis with a Dino Crisis demo disc released in 1999. Boxart for the PS1 version of Nemesis. Enlarged for your reading pleasure.Thanks to Moby Games. So at this time someone, or some people, at Capcom are trying to make a specific point of these. One might have been a joke and nothing more, but two so far as a trend seems to be trying to say something. 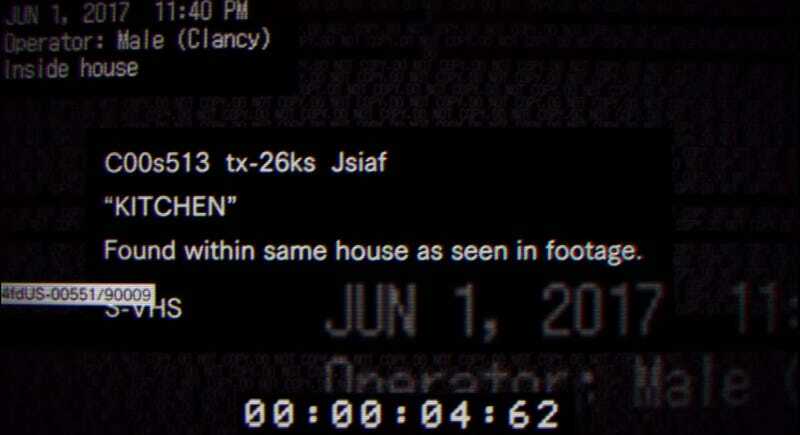 Unless every in-game VHS is coded with an SKU from a previous RE game from the the past (there are still both other US ones, as well as European and Japanese SKU codes they could use)... then it could really be just an easter egg. But if not, and it’s hinting at something, then we have to look at it more broadly. The best assumption everyone is making should it mean something specific is that Capcom is going to put a demo of something with Resident Evil 7's release in Jan 2017. Now there is plenty of possibility of Capcom putting any sort of game in there, including some unknown VR title or a sequel to another franchise. One of these two had a demo for Dino Crisis after all. However in Japan Dino Crisis launched first. And it had a demo for Biohazard 3: Last Escape (which was Nemesis’ title in Japan) it’s worth noting as well. But there is one major expected release for the company in the Resident Evil franchise that seems the most likely candidate should this be the path they’re going down. We do it! But we’re not showing it to you yet! Indeed, a demo of the Remake of Resident Evil 2 - never before seen prior to 7's release would indeed make the most sense. Given all the toying that’s been going on with their crazy marketing plan of late, this seems possible. Especially given that nothing has appeared of the planned Remake yet publicly other than the announcement it’s begun. It’s also surprising especially to have not appeared in any form or be mentioned at all during any of the 20th Anniversary events this year. Something doesn’t seem right not to have a teaser at least of the project at all at this point unless they had cancelled the project - which seems highly unlikely. It’s also worth a final note that the launch week of RE7 is exactly 19 years since Resident Evil 2 first appeared on the PS1. It launched Jan 21st 1998 in the US, and Jan 28th 1998 in Japan. In the end this guess certainly could be wrong, but someone at Capcom is putting these SKU codes in there for some reason. I’m hoping it’s not a trick and something comes about. I guess we’ll all find out early next year when the release of RE7 comes.